Under patronage of the Municipal centre of information and culture Krnov, together with Ministry of Culture, under the patronage of town major of Krnov, the Mir 70 theatre will again be the meeting point for film enthusiasts from not only the Czech Republic but also visitors from many European counties, including Austria, Holland, France, Poland and Germany. The event is organized in collaboration with town Krnov, supported by the Ministry of Culture of the Czech Republic. The event also cooperates with Polska Federacja dyskusyjnych klubów filmowych. "The name of the festival - KRRR! - which is a part of the festival logo originated in Filmochod agency which is responsible for unified visual presentation of our event. It has several meanings: KRRR! can be seen as an interjection - a group of consonants which evokes the sound of the projector machine, or from point of view of phonetic terms a combination of voiceless and consonant sounds (velar and dental) forming (almost unpronounceable for foreigners) beginning of the city name - Krnov. This original idea which approval aroused strong reactions is hoped to attract new visitors as well as fulfil expectations and standard of those faithful patrons from past years". 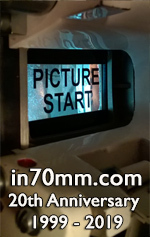 The 70mm cinema Mír 70 in Krnov is currently only one in the Visegrad Four countries (Czech Republic, Slovakia, Poland and Hungary), which is able to screen 70mm film of the original, six-track magnetic stereo sound to 105 square meters of slightly curved screen (nowdays fully digitalized). One of the main task of the festival is to recall now unused film format which dazzled visitors in its time by brilliant display of details in picture and and insurmountable sound to nowadays public - DESPITE ALL THE DRAWBACKS THAT OLD AND WORN-OUT COPIES OF 70mm FILMS BRING. Includes admission to all screenings during the three days. It does not include accommodation.